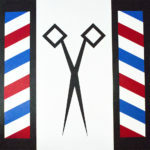 The barbershop, located at Main Street was a mainstay in the Village for nearly a century! In 1895, Edward Wehrstein , “Eddie the Barber”, began cutting hair, trimming mustaches and beards and shaving hundreds of faces. Eddie used to reward his youngest customers – boys and girls – with a chocolate bar when they received a haircut. After Eddie retired in 1953, his youngest son, Lloyd, who served overseas in the RCAF during World War II, carried on the family tradition until 1985. The barber pole located on the outer edges of the barn quilt block represents that of a barber shop that cuts hair and does shaves. The traditional barber chair had adjustable height, rotated or leaned backwards, had a footrest for the client and were usually made of metal and leather. The early tools of a barber included: hair clipper, barber cloth or wrap, barber neck paper / tape, comb, hair scissors, shave brush to name a few. The mainstay tool of the barber was the scissor, hence the dominate centre location in the barn quilt block.